Gossip Bobrisky : Yes I'm gay or straight how is it u guys problem? Bobrisky : Yes I'm gay or straight how is it u guys problem? 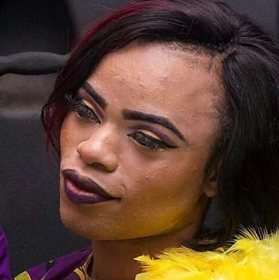 Bobrisky took to his Instagram page after angry Nigerians blast him over Lawani's post accusing him of using instagram filters. Bobrisky. Who was still boiling over the issue listed some of his achievements at 25..
alone in lekki well furnished u can check my snap for enough videos not with friends. haters will say is not my house that I rented it. At least I pay rent I have access to it whenever I want. I drive 2012 benz I also own a Lexus and a Toyota Camry. continue hating na u sabi. If na my bleach dey pain u Abeg go bleach urs too cos na light skin dey market now. go and change it. At d same time I won't blame u na Buhari fault. Bobrisky skin is bad I still sell packages today yet my cream is not good. i just thought of it today y are some people so jobless ? Na dem go find gay, na dem for bad skin, y can't u find urself a job to do. go around ig tagging all his/her relations"